Traditionally (prior to Lync anyway) most SIP Servers would speak of a SIP Realm. This SIP Realm is now what is being referred to as the SIP Domain. So what should you call your Lync SIP Domain then? Why is using a domain.local not a good idea? Firstly if you EVER want to extend your Lync deployment to include access from externally (be that mobility or federation) then you will have some rather major road blocks. Why? DNS – These methods use DNS to find the services on offer, basically you cant add a domain.local name to the public DNS. This means that none of the automated, built-in discovery mechanisms are going to work. 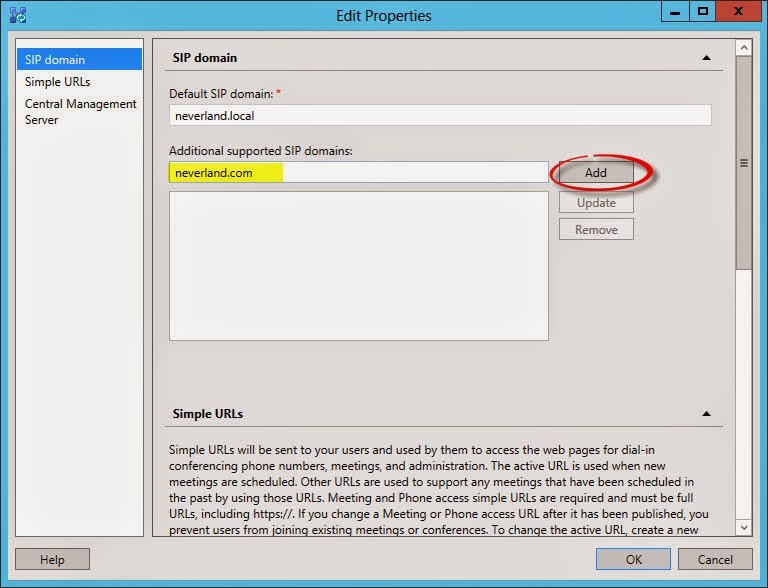 Won’t changing the SIP Domain break SSO (Single Sign On) if the SIP address doesn’t match the UPN? 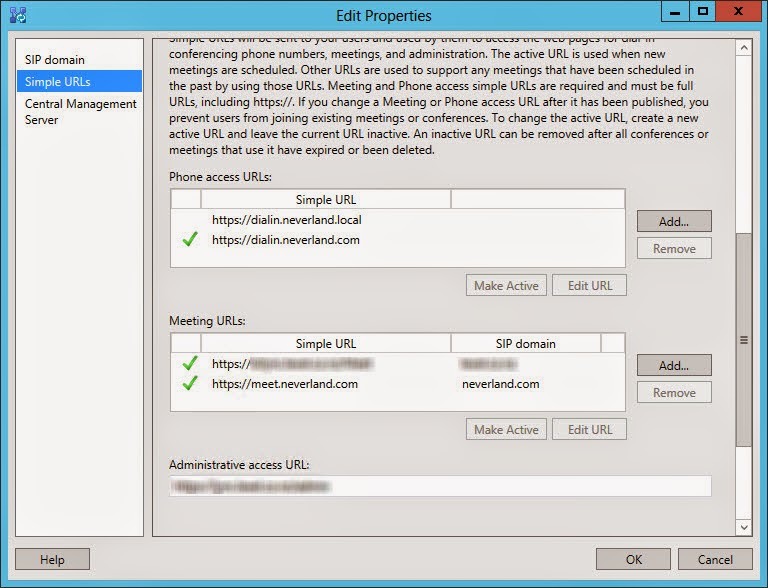 Of course, the exception is when the user has already signed in to Lync using a user@domain.local SIP address. In this event the Lync Sign in details would have been saved in the registry, this will need to be removed to avoid user interruption during automatic sign in. Whats the risk in changing the SIP Domain? Generally I find that organizations come across the SIP Domain issue before deploying Enterprise Voice. Hopefully early in the roll out or adoption as the more users on Lync using the various features the more users may be affected. You need to own the Public DNS names space for the SIP Domain as you will need to add some A and SRV records. Internally the DNS names also need to be valid (usually Split Brain DNS is best) for auto sign in of the clients – perhaps you reason that you will push out manual SIP Server\Pool FQDN’s to the clients to circumvent this – you may regret this later should you want to include Pool fail over as this leverages auto discover. If you already have a Public Certificate it will need to change significantly, the assumption is that most haven’t quite got to the public certificate yet and would have had trouble proceeding with a domain.local addresses in the SAN anyway. 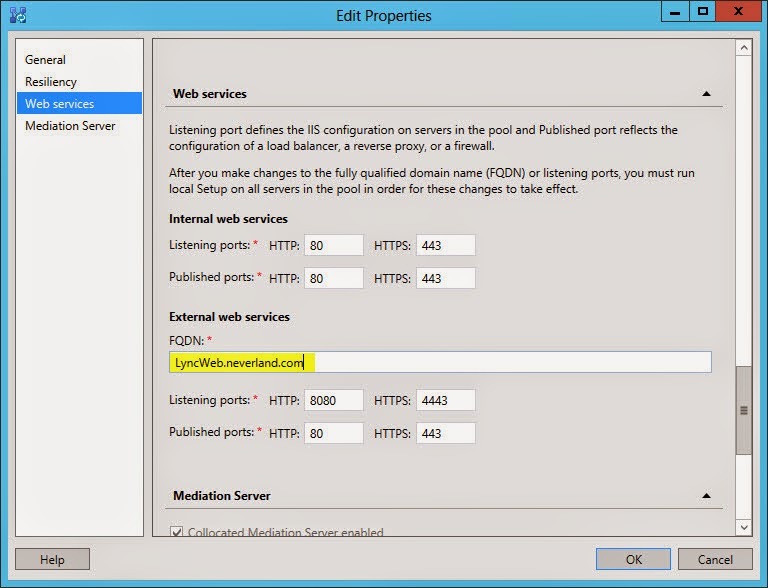 You DO NOT need to change any of the internal Lync Server FQDN’s. And of course the users will need to have the local Lync sign in registry key removed prior to changing their SIP address to the new domain.com address format. * The UM Auto Attendant and Subscriber Access SIP Addresses will need to be changed to domain.com as well. ** If Response Groups are already deployed then the SIP Address assigned to each workflow will be assigned to a domain.local address and thus will have to be corrected prior to removing the domain.local SIP Domain. I didn’t say it was going to be a small piece of work..
You could reason that the change is too much to take on BUT know that it will need addressing sooner or later. The more dependent users become on Lync the harder it will become to rectify this later. 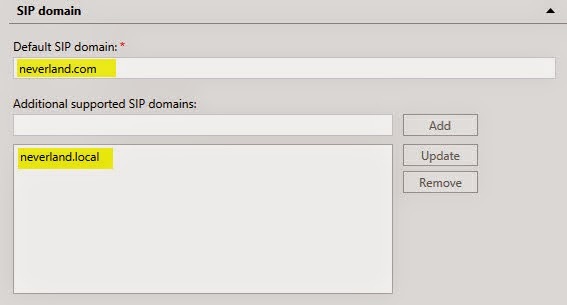 How do I move my Lync SIP Domain from a domain.local to a domain.com? The process is more like adding another SIP Domain, then moving all the associated bits over. Followed by removing the old SIP Domain. You will notice that the new meeting URL has been added automagically. 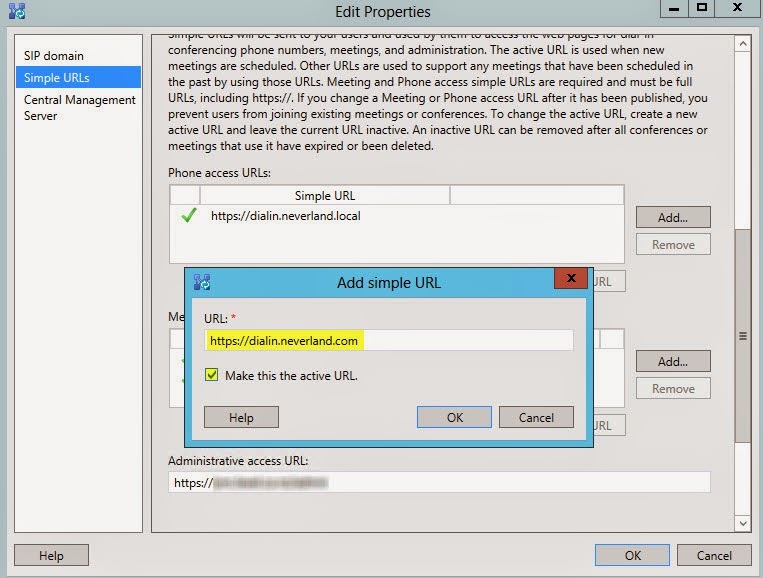 The new SIP Domain can leverage the existing Dialin URL however in this case it will be dialin.neverland.local which wont do as its not accessible from external. Next change the external URL (this is the URL that hosts the ABS, GAL and a few other services. Go ahead and publish this. 7. Get the users to sign in with the new address automatically. Removing the Old SIP Domain entirely is not recommended as there are several RtcApplications including Conferencing, Audio Test Service, RGS, CAA etc. which have SIP addresses assigned to them at the time of the initial configuration. These addresses are associated with the default SIP domain at the time. Changing the default SIP Domain in the Topology builder (or Powershell) does not update these Lync Objects. For this reason it may be safest to add the old SIP Domain as an Additionally Supported SIP Domain. If you have good (I mean close to the Lync product team) connections inside that stupid company called MS, raise the idea there so in the next version they may re-word that part of the wizard. Or not. Maybe they keep some parts not so easy to understand, so their customers keep buying PSS hours which generates revenue.